After the product hit the shelves in the marketplace, it requires neat and proper label to create its unique identity. The visual appearance of the product should be eye-catching and neatly fixed to increase its selling potential. Manual labeling of products that comes in masses is absolutely time consuming, costly and such a tedious task. Thus, labeling machinery should be employed to speed up the process while lessening the time required completing it. There are various models of labeling machinery for packaging products; one can see a lot of assortments using the internet. Asking for a quote, specifications and additional inquiries will be very accessible as most of packaging equipment suppliers includes those special features in their websites. However, it should be noted that one should be responsible in ensuring the safety of the payment method into the supplier’s website. There are certain factors that should be taken into consideration upon buying labeling machinery, some of which are the types of container to be labeled, its size, and features of the machines. Some of the machines that are mostly available in the market are wet glue labeler, self-adhesive sticker labeling machine, wrap around sticker labeling machine, sticker labeling machine, automatic front, back and top labeler and a lot more. 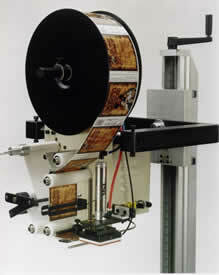 Self-adhesive labeling machine – is used in attaching sticker labels to the products. Shrink Sleeve Labeler – is perfect for containers like bottles that have different shapes. This machine will shrink the label tightly around the surface of the cylindrical objects with the help of heat. Side Labeling Machines – is used to label different sides of the product (left and right). Back and Front Labeler – wraps or label the products on its back or front area. Top-side labeling machine – is ideal to use for placing label on the top part of the product. Wrap-around sticker labeler – is best if the product needs to be wrap on all of its sides. All of these labeling machinery can be fully automatic or semi-automatic. Though semi-automatic machines comes cheaper, fully-automatic machines are much favored since all of the process can be done automatically. As far as efficiency is concern, fully-automatic still outranks as it is much productive and more convenient.